We love this video. This is techno! It also got me thinking: Dopplereffekt and Frak both wear lab coats. And they both make awesome music. That might not be a coincidence. So my initial conclusion is that techno needs more people with lab coats. If you need further convincing, check out this ssg special, which is a recording of Frak's set at the "Triffid Gossip" release party a few weeks ago. We want more techno like this please. The "Triffid Gossip" EP on Kontra has been disappearing quickly, so I would suggest getting a copy while you can. If you want to check out more Frak, the best place to look is their label and online store, Börft Records. Their sub-label UFO Mongo has started a new series called 'Sythesator', which has some amazing music. For anyone in Malmö, on 18 May there will be a Börft Records 25 years celebration at Inkonst. And for the rest of us, I have a feeling it is time for us to all doing a lot of digging around Frak and Börft. Thanks to Frak and Ulf for the recording. Enjoy! man, they look like the techno equivalent of 80's b-movies. If you are around, do not miss the börft-25 years party at Inkonst in Malmo, Sweden. Date is May 18 and more info can be found here. i wish you guys would be more acidic in your criticism of contemporary techno, and name more names. all this vague pointing in the direction of 'music that is made for berghain' is not specific enough anymore. NAME NAMES! @soyuz and chris : i get your respective points about reacting to some prevailing sounds in contemporary (underground) techno, but, honestly, what is the point in dissing such and such producers for their natural affiliations ? Will you openly criticize some guys for making records and hoping to get playlisted by Dozzy at the Lab ? (pure random example). Do these guys really aim at such and such djs, or are they just under a strong influence and making stuff they like ? Has it ever really been otherwise in other times and places of the club and dj era ???? I personnaly more relate to Fengler in the Berghain family, but have no issues whatsoever with Klock, or Dettmann. They became iconic of this particular institution and I don't see them do no harm on a global level. 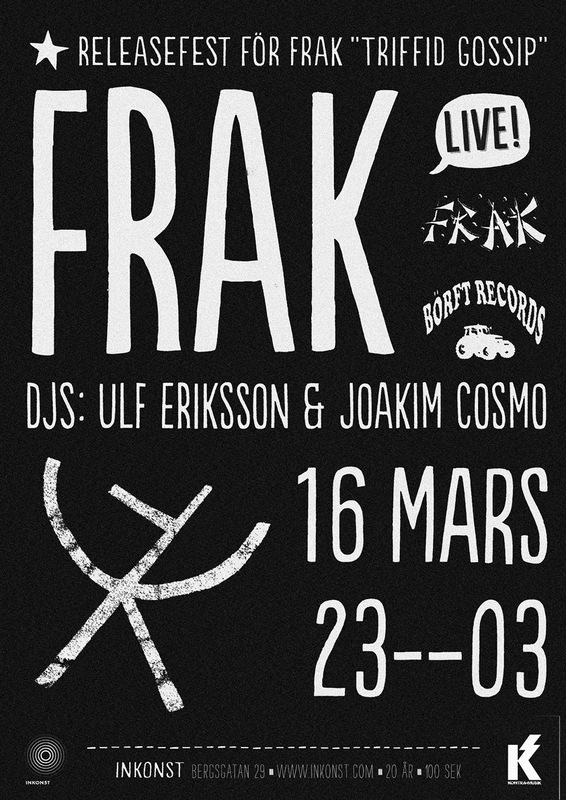 Frak may 'be techno', but so are the Berghain guys, and Dozzy, and Vril, and Psycatron, and Legowelt, and ... you name them. Shouldn't we know better than easy dogmatism when it comes to defining music (in this case techno) we consider relevant for today and possibly tomorrow ? Anyways, thanks for this Frak-set, I do like a good injection of lo-fi electronic folk music now and then, whatever it is actually supposed to be called. And unlike so many well-aged electronic music veterans, Frak's recent output is some of its very best.